In the meantime, enjoy the html version below. I guess. If that's your thing. 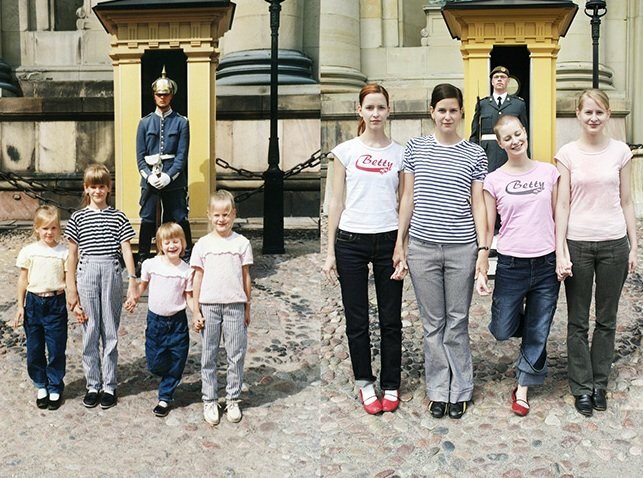 Photographer Wilma Hurskainen and her three sisters spent a lot of time together growing up, vacationing with their parents, and being silly. She had the idea to do it all over again, 15 years later and turned the resulting photographs into a book called Growth. Take a look at some of the intricately set and posed photos they wound up shooting together. "The general feeling in the series is very light and happy so I sometimes forget that my initial feeling when starting to make the images was quite sad. I thought the images would speak of letting go, losing moments and even people in time, nostalgia, etc," Hurskainen told My Modern Met. The sisters even got their mom and dad in on the action. Hurskainen writes, "I'm the oldest of us four sisters, so by the time we were shooting (or re-shooting) the images I might still have had a certain big sister advantage - making the little sisters go my way. 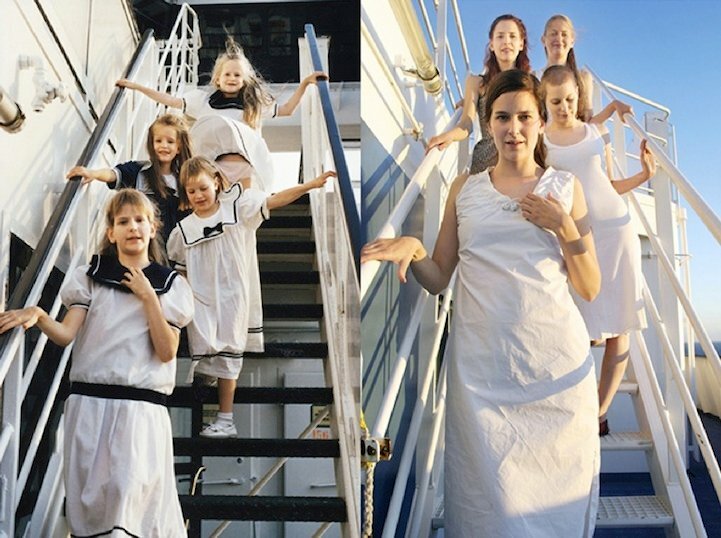 No, seriously, it wasn't always easy convincing them that we should make this series, especially in 2004-2006 when we re-photographed, we all lived in different cities and countries and whenever we met we would travel to Eastern Finland or Sweden for these photo sessions." "It was sometimes a little hard finding the places of the original photos, finding the proper clothing and dealing with the emotions that emerged because of the process of digging up the past," Hurskainen said. "Also, on the technical side, back in 2004 or so digital cameras weren't so great so we actually shot some of the images on film which now seems just unbelievable! We had the camera on a tripod and then we looked at the old photograph and tried to imitate ourselves (or our children selves)." "The first images were photographed by my father in the 80's (I think around 1986-1990 or so). I'm around 7 to 11 years old in them and my sisters are 2 years younger than me and 4 years younger than me (the twins). So about 15-20 years had passed between the two shots." "My parents still live in the same house where we lived when we were children. So we were actually able to find some of the original clothes, dolls, etc which is quite strange," she said. "The most important thing is that in the end my sisters were pleased with the whole thing," said Hurskainen. "I already suggested that we should do it again after another 15 years but they weren't too happy about this idea!" I think I speak for everyone when I say, "yes, please!"